Investing in small cap stocks isn't for everyone, but these two unknown businesses exhibit all the signs of long-term market-beating stocks. "Notice the small things. The rewards are inversely proportional." In investing, as in life, big things can come in small packages, which is exactly the idea behind investing in small-cap stocks. However, investing in small-cap companies can seem like something of a black box to many investors. So to jump-start this discussion, what exactly are small cap stocks? Though no absolute definition exists, small-cap stocks are generally companies with market capitalizations between $200 million and $2 billion. Because of their relatively diminutive size, small-cap stocks often exhibit higher growth rates than more established companies, which, importantly, can also bring greater risk. Here's a chart of two of the best small-cap stocks on the market today. Let's dive deeper into each company to see why these names are indeed the best small-cap stocks to buy now. Though its near-term earnings reports have had some light operational headwinds, Popeyes Louisiana Kitchen's (NASDAQ:PLKI) broader results demonstrate the true power of the regional fast-food chain's business model. Operating under the name AFC Enterprises before 2014, the company is a prime example of the impressive cumulative effects that a winning business model can produce over time. Let's run through both pieces of this money-making equation. Popeyes Louisiana Kitchen has a longtime track record of balancing consistent growth with impressive profitability. Since the company was originally recommended by The Motley Fool's Hidden Gems service, the small-cap restaurant chain has gradually increased its market share in the domestic chicken quick-service restaurant (QSR) category from just over 20% in 2013 to 25.5% at the end of 2015 to 26.3% in its most recent quarterly report. The company has also been able to increase domestic same-store sales for an impressive 21 straight quarters. In terms of profitability, the company's shrewd mixed use of franchising and company-owned stores has allowed it to consistently maintain margins in the mid-to-high teens. Image Source: Popeyes Louisiana Kitchen. Over the long term, the company hopes to maintain an adjusted EPS growth rate of between 13% and 15%. At first glance, Popeyes' 20 times forward P/E ratio might seem expensive. 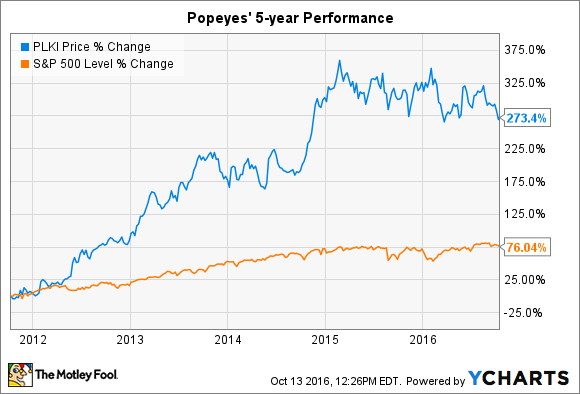 However, as a company with a battle-tested recipe for results firmly in place, Popeyes seems likely to handily outgrow its current valuation for long-term investors in this small-cap growth stock. You've probably heard of 3D printing, which has been touted as one of the next major tech trends set to reshape the manufacturing industry. Intriguingly, one of the companies poised to capitalize on this generational trend is small-cap stock Proto Labs (NYSE:PRLB). Like many great start-ups, Proto Labs was conceived because of a deficiency in the marketplace for small-batch design and manufacturing, and it presents a fantastic opportunity for small-cap investors today. Frustrated by the extreme costs and time delays associated with small-batch design and manufacturing of industrial parts, Proto Labs founder Larry Lukis sought to create a better way for small businesses to design and buy injection-molded plastic prototype parts. He created his own design software and harnessed the power of 3D printing to found Proto Labs, which has moved into a number of other areas of industrial design and manufacturing. The results have been compelling, to say the least. In its fiscal year 2015, the company served over 27,000 product developers and engineers and produced annual sales of over $250 million. Looking at the bigger picture, the company estimates that it enjoys a $20 billion estimated total addressable market. Equally noteworthy for a high-growth start-up, Proto Labs is already enviably profitable. In its FY 2015, the company grew sales 25%, while also maintaining a 58.6% gross margin and a 25.4% operating margin, which is quite close to the long-term financial model it also foresees. Trading at 25 times forward earnings -- roughly in line with the S&P 500's trailing-12-month P/E ratio -- Proto Labs looks like a relatively cheap small-cap stock given its big-ticket growth potential.